Elle's Studio March Kit Reveal! How about a look at the beautiful, springy March 2019 kit?! 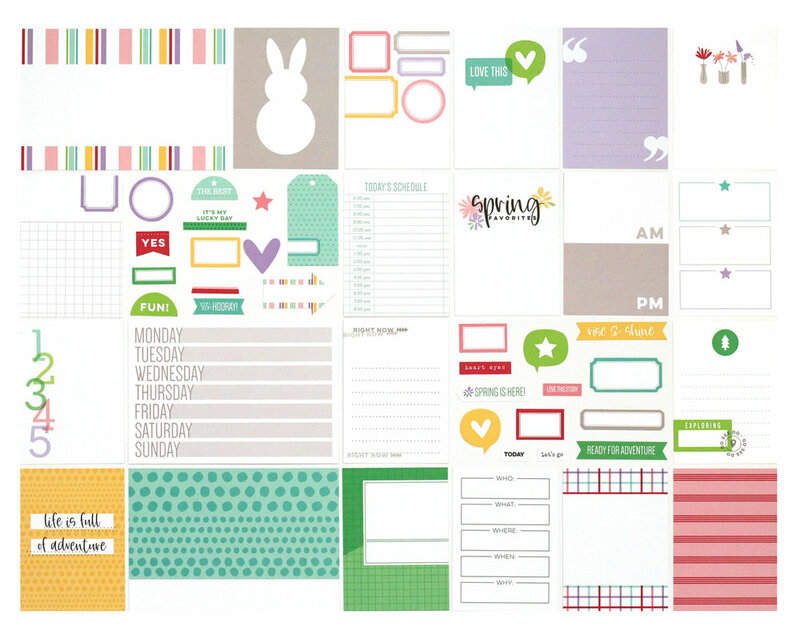 These tags and die cuts will have you documenting your springtime memories in a beautiful way, whether you are recording everyday life, or special holiday events! Don’t forget about these amazing add-ons to embellish your projects! From beautiful new patterns to yummy chocolate bunnies, you’ll want to add a few of these to your projects this month! I started out by creating some Easter cards this month! 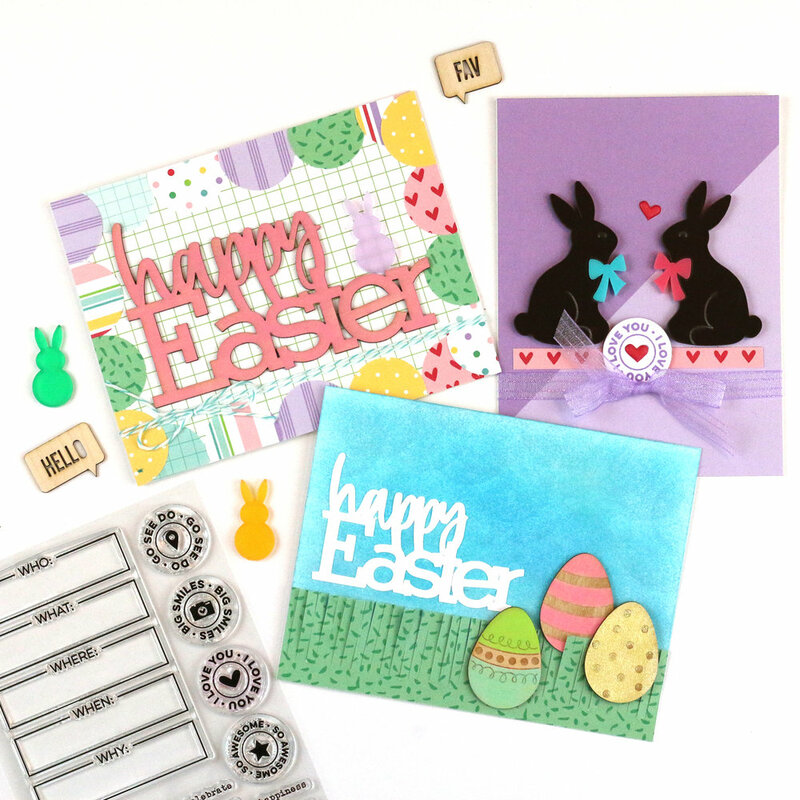 I could not resist using the wonderful Easter wood veneer or acrylic pieces, and I had a great time with all of the patterns in the Springtime 6 x 6 paper stack! Fun, right? 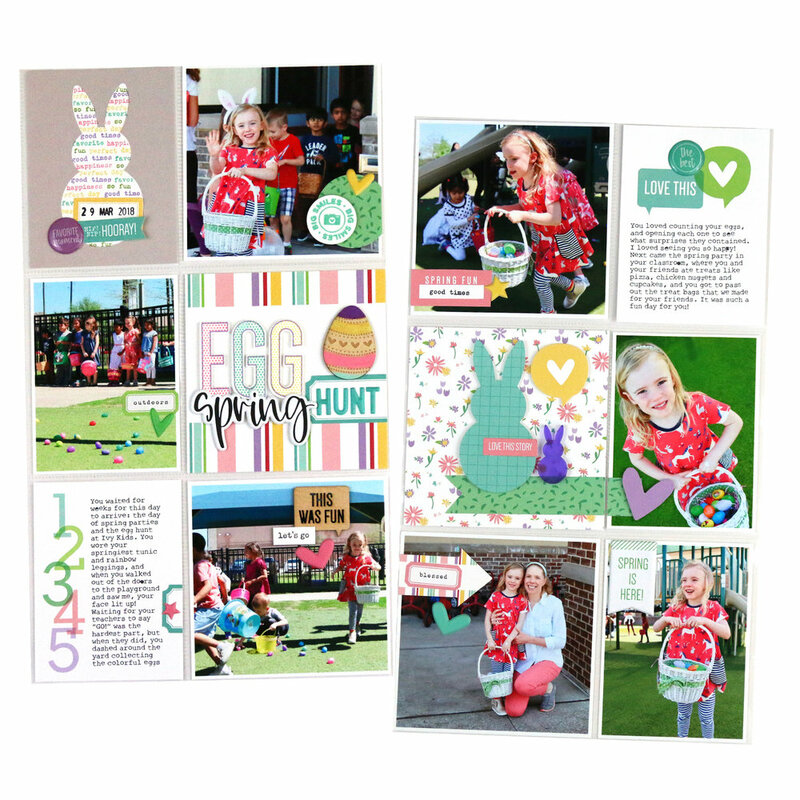 I also created a new pocket page spread, all about my daughter’s favorite spring pastime: egg hunting! I love the happy day that this project documents, and the March kit and extras were perfect to pull it all together in my album. 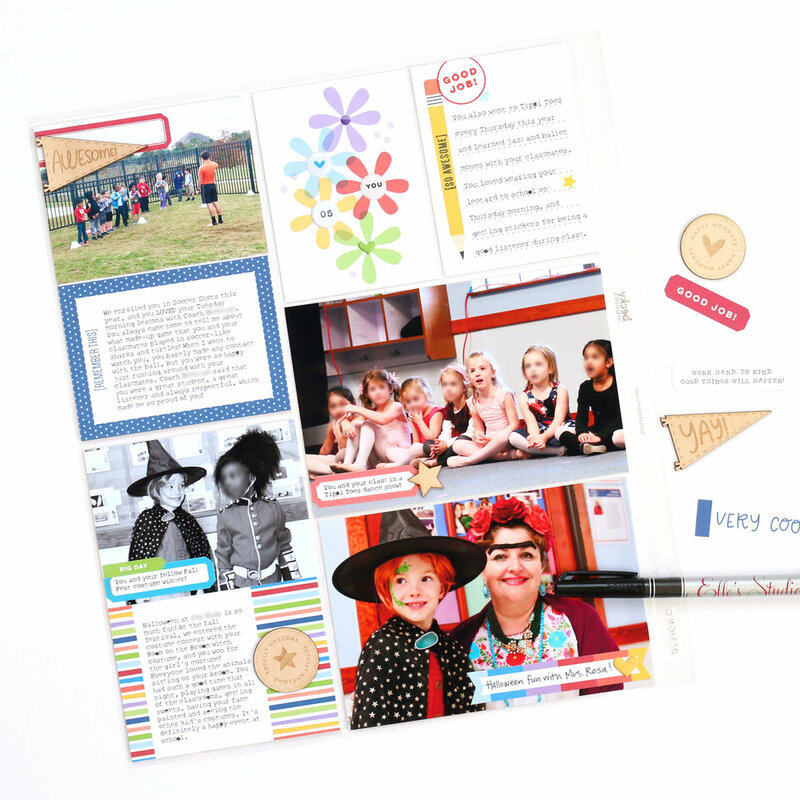 Do you want to see how I put this pocket page spread together using my new ES goodies? Take a look! I hope you enjoyed taking a peek into my process, and I hope YOU enjoy creating with the Elle’s Studio March goodies as much as I have! Shop all of the product that I used to create this page via my gallery below, which will take you right to the ES shop. Thanks for your support of my YouTube feed and blog by clicking, and happy creating! 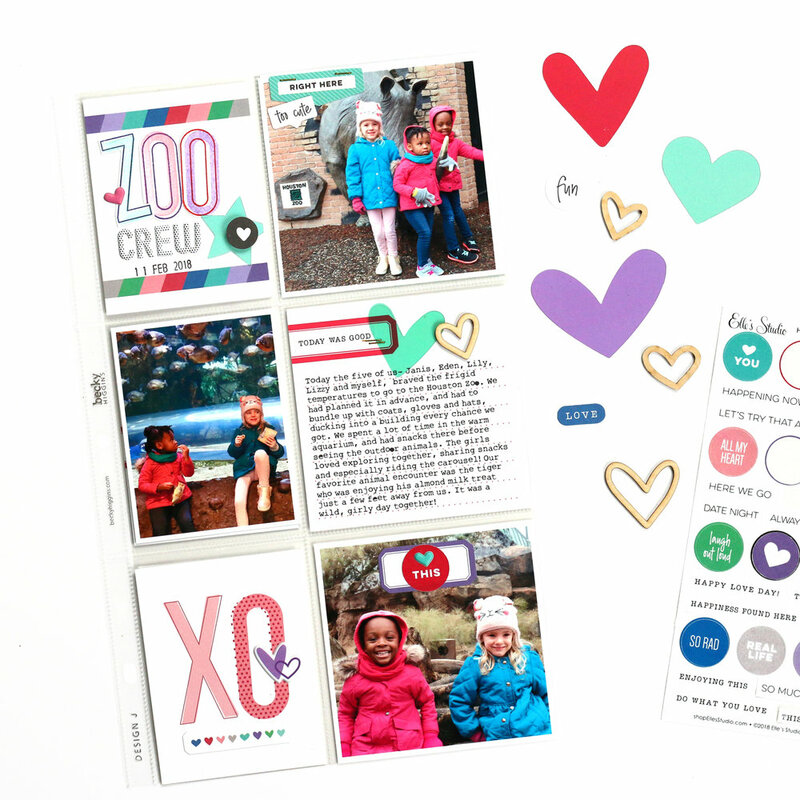 Yesterday I shared the newest kit release* from Elle’s Studio, along with an 8-1/2” x 11” layout, and today I’m switching gears to share an event-based, 7” x 12” pocket page layout, all about a colorful trip to the Houston Zoo with our besties. The colors of the kiddo’s bright coats on this cold day were perfect for using alongside this kit—no black and white photos needed here! On the front of the page, I created a title using the outline and solid Jane Alphabet Stamps—the largest that Elle has ever released. 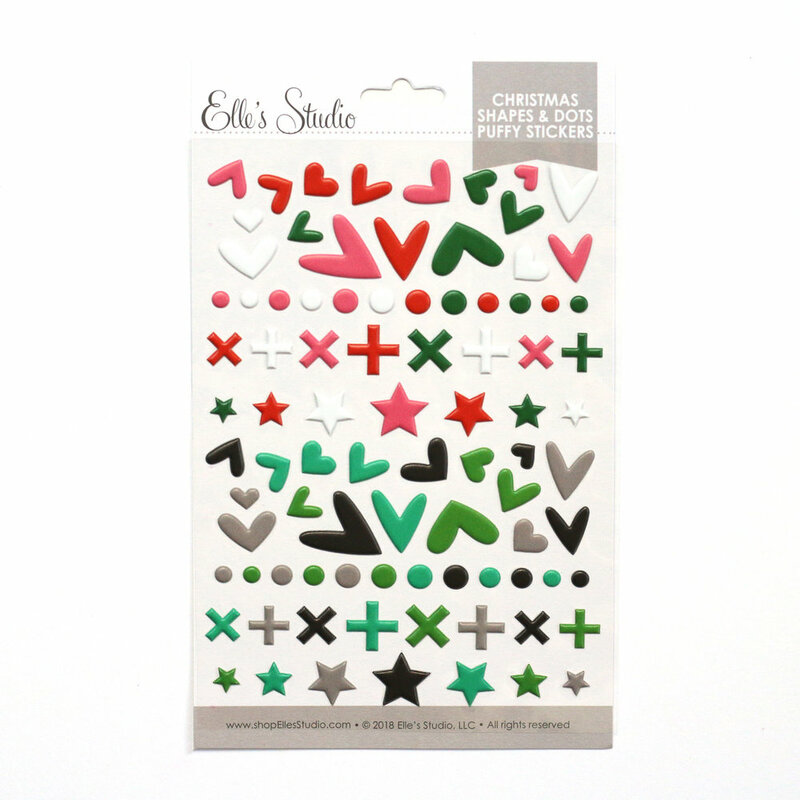 I love that they coordinate with the “XO” tag in the January kit, found at the base of my page. These are definitely my new favorite alphabet stamps and I love that they are large enough to use on layouts, but still great for pockets, too! The black and white polka dot puffy alphas were great for finishing off my title against the larger alphas. This tag was created using the Love You printables—the tag was originally 3” x 4” and I stretched it to 4” x 4”. I love that you can make anything work with digital files! I simply added the “today was good” Happiness Found sticker, an acetate heart die cut and a wood veneer heart to embellish my main journaling tag. I kept the same colorful hues on the back of the layout, matching the tags to the coordinating photos by the most bold color in the photo. Not much more journaling was required, so I keep to mainly pretty filler tags. My favorite pocket on the back was created with the heart 4” x 6” tag from the January kit. 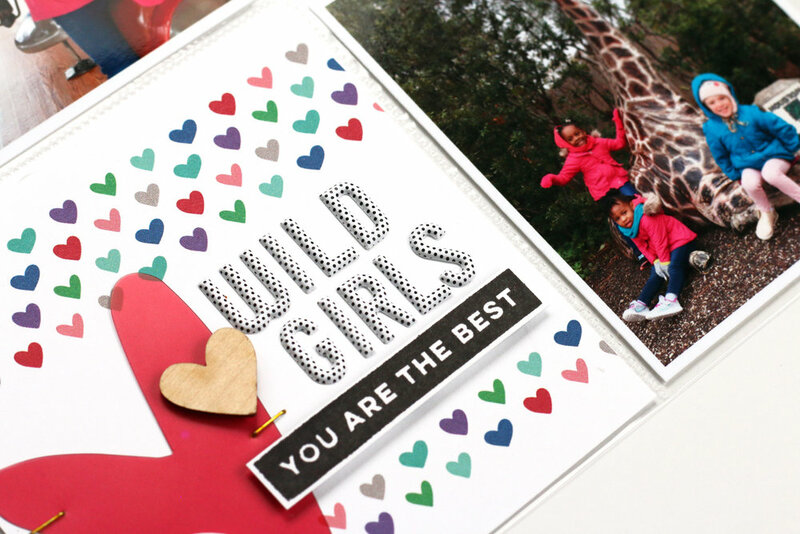 From there I added “wild girls” using the black and white polka dot puffy alphas and “you are the best” with the Happy Heart stamp. Since three girlies enjoyed this day, I added three hearts: a die-cut circle heart from the January kit, a red acetate heart die cut and a solid wood veneer heart. I love this spread, and the day that it records! Be sure to grab these supplies while they last in the Elle’s Studio shop, via the links in the gallery below. Thanks so much for reading, and happy creating! Hello there! In case you missed my Elle’s Studio November reveal blog post, be sure to click here to watch my unboxing video to preview all of the new goodies in the shop this month! In this post, I’m going to share my second project with you, created with the November 2018 kit and add-ons*, a 24” x 12” pocket page spread, which I created to document November of 2015, a hole in my monthly album! This kit was just perfect for all of my photos! I had so many deep blues and bright reds, as well as green, and the themes in the kit this month could not have been more perfect either. 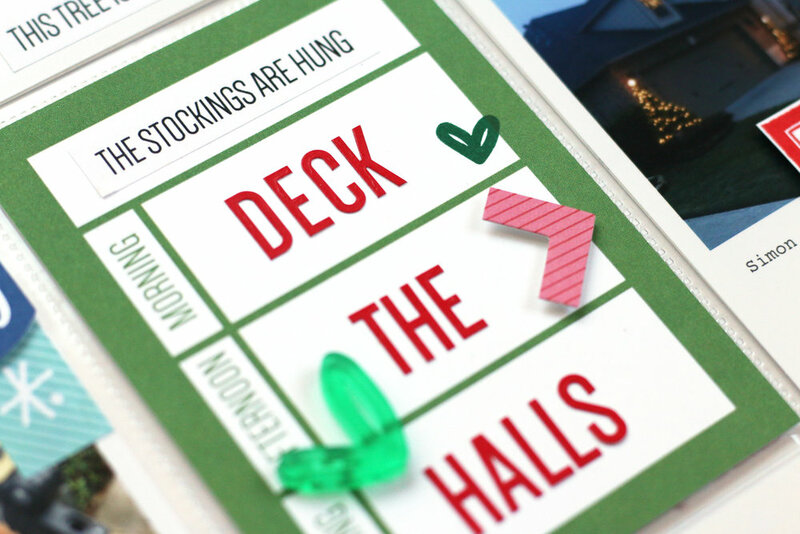 I created my 4” x 6” title tag using the ledger tag from the November kit, which I accented with my favorite add-on this month, springs of greenery from the Merry Moment stamp. I also punched a red circle from the Merry and Bright 6” x 6” paper stack, and accented that grouping with a Christmas hand drawn acrylic heart. 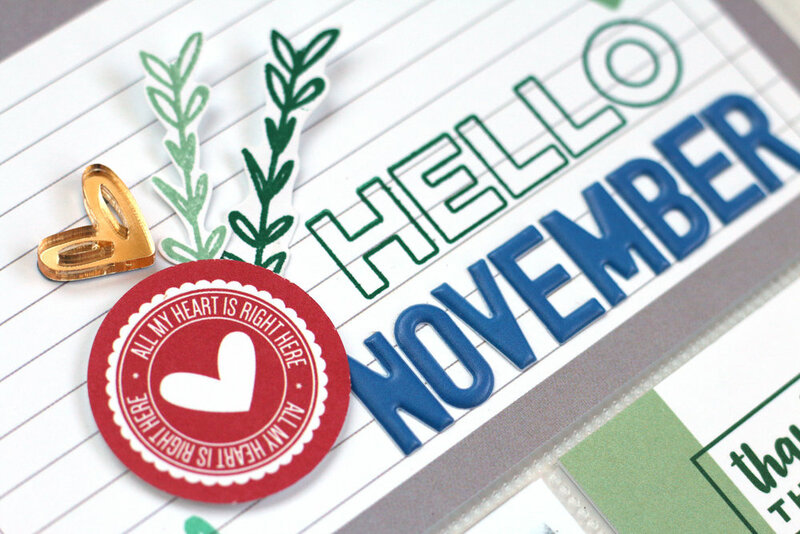 I stamped “hello” using the Title Builder stamp, then added “November” with the new navy puffy alphabet stickers. You may have noticed this 3” x 4” tag in the Elle’s Studio sneak video on Instagram (which we release every month on the 1st!). The “the stockings are hung” phrase can be found in the This Season phrase stickers, which have a wide range of phrases which can fit for your November and December stories! Then I added the fabulous red Jane alphabet stickers to add “deck the halls,” and accented with a die-cut arrow from the November kit, a stamped heart from the Merry Moment stamp and a Christmas hand drawn acrylic heart. It was the perfect tag to point to the photo of our house lit up with twinkle lights! I couldn’t forget about the beautiful blue hue in the kit! I grabbed the blue dot pattern found in the Merry and Bright 6” x 6” paper stack to create a custom 3” x 4” tag, then stamped the “a day to remember” circle with the Merry Moment stamp and fussy cut it out, adhering it to the patterned paper. Last, I added a long journaling tag, found on a 4” x 6” tag in the November kit, adding the word “proud” with the navy Jane alphabet stickers and another This Season phrase sticker. I love that this tag spans three different pockets to tie them together! I know you will love using this kit and coordinating add-ons to tell your stories, whether inside or outside of the pocket! Be sure to shop all of the products that I used to create this spread in my shapable gallery below, which will take you directly to that product in the Elle’s Studio shop! Happy creating! Back in March, I went on a journey with Whole30, and it changed my life, my body and my mind. I started the program to kick my sugar habit, as I really have a sweet tooth and always wanted sweets after a meal. 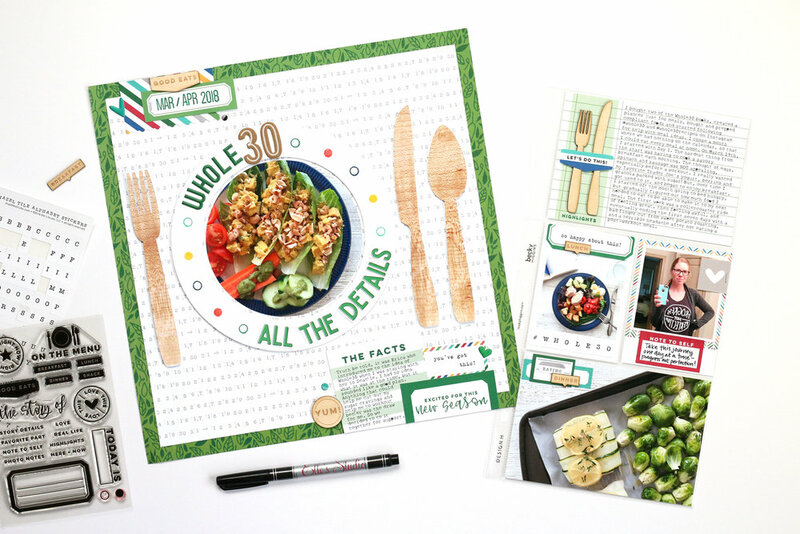 I wanted to document this month in my album, and the Elle’s Studio September 2018 kit and add-ons*, full of food-themed products, was perfect for this project. I could tell you all about how I created this layout and pocket page spread, but why not watch my process video instead? The back side of the pocket page was not included in my process video, so here’s a look at how it turned out. 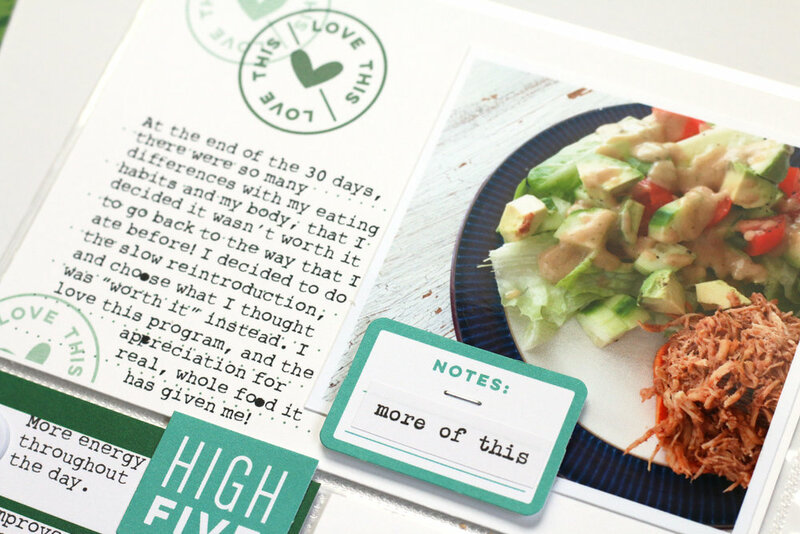 At the top of the page, I used a digital tag from the New Season printables to add my journaling on the left side of the 4” x 6” pocket, then adhered a 3” x 3” photo of one of my favorite dinners on the right side. The “notes” die cut from the September kit and “more of this” Here and Now phrase sticker finished off the pocket. Can I just say that I have been hoarding the circle numbers in the Noteworthy puffy stickers since the collection released in April!? I finally had a good excuse to use them: to document my non-scale victories—or things that I noticed changing in my body besides my weight. Next to that, on the “favorites” New Season printables tag, I added a list of my favorite foods and meals during my month of Whole30. Even though I did not start this program to lose any weight, my before and after image is pretty telling—I lost fat, gained muscle and just felt better overall. I also kicked my “need” for sugar! I added my before and after photos to the bottom pocket, separating them with the wooden spoon from the Good Eats wood veneer, adding the “this happened” die-cut from the September kit to the top. At the bottom, I added the words “before” and “after” to the colorful September labels using the new Hazel white alpha stickers. This has to be one of my favorite projects in my album—both because I love the product that I used and the subject that I’m documenting so much! Be sure to check out all of the product I used on this spread in the gallery links below, which will take you directly to the Elle’s Studio shop. Thanks so much for stopping by! If you’re interested in the Whole30 program, be sure to check out their website for all of the details! This Design J pocket page is one of my favorites, and I had documented a fun day visiting the U.S.S. Midway with it before—it's one of my favorite pocket pages that I've created this year. I decided to not re-invent the wheel, so I used the exact same photo/tag layout that I used for that page on this one. It helped me to complete this page faster, and know exactly where I would place my photos and journaling tags. The highlight of this page for me is the title tag with the cutest baseball bat wood veneer piece, and the photo of my daughter with the female mascot, Rosie, next to it. I could not resist stamping a border of those cute baseballs from the Go Team stamp with water-based markers so that the stitching could be red! It's all in the details, right? Another fun detail that I added was the red bakers twine knots on this "we won" wood veneer piece from the Go Team wood veneer. It only took an extra minute, and I love the way it looks at the top of my photo. You can see how all of these elements came together in my quick process video! 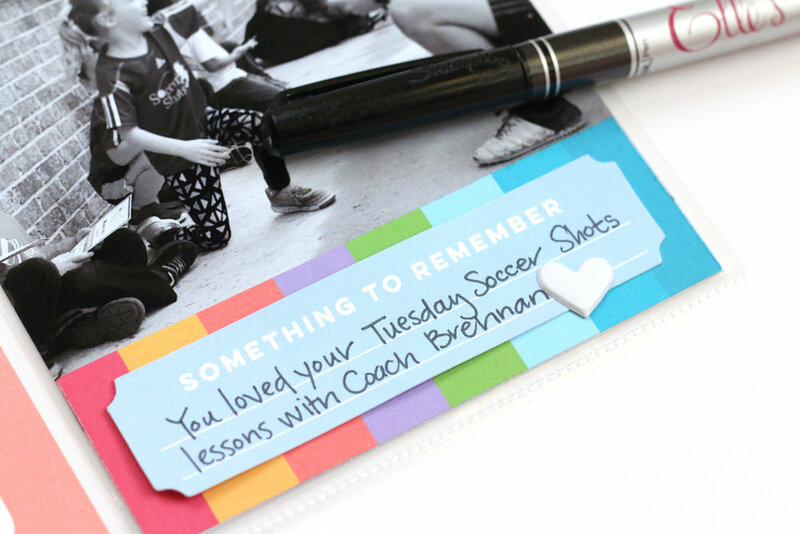 In it, I'll show you how to create that baseball border, how I messed up while stamping my title tag (real life! ), and how I put just the right amount of embellishment around my pages. Thanks so much for watching and stopping by my blog today! I hope you're as excited about the new September release from Elle's Studio as much as I am! Be sure to grab up these goodies before they're gone—the August kit sold out weeks ago, so don't delay! You can also see all of the product that I used to create this pocket page in the shoppable gallery below. Happy creating! In the summer of 2016, we were hoping to make a big move to Kentucky. However, for some reason that just wasn't in God's plan, so we ended up staying in Texas. We had spruced up our home to get it ready to lease out, which included professional photos. So to make lemonade out of lemons, I have a really lovely documentation of how our house looked that summer, and I decided to record it in a pocket page using the Ali Edwards Home Story Kit. 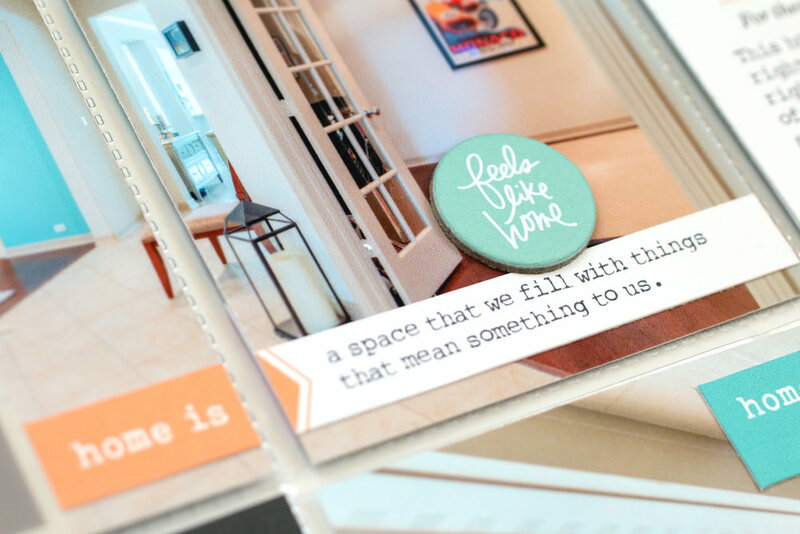 This kit included the perfect colors for documenting our home, and I used the "home is" add-on labels to record what home is, from the perspective of each room that I documented. Recording "the story of" my daughter's playroom on the 3" x 4" card was important, as when she became old enough to have enough toys, we decided to forgo a formal dining room to make it her playroom—one of the best decisions we have made in this house! I wanted to get that down in writing. Even two years later, our bedroom looks completely different now, with new furniture, color on the walls and new bedding. I'm happy to have what it looked like before recorded, and it will be interesting to re-create all of these images again to compare them to our home in 2016. The backside of the layout includes my daughter's room and my creative space—my two favorite places in the house! The teal in the kit worked perfectly with all of the teal in my photos. This "five senses of home" card was really special to me. I sat down and closed my eyes to think about what home looked, smelled, tasted and sounded like. It makes me happy to have these down on paper. We as a family like to embrace the "less is more" attitude, so it was important for me to add that home is a space that we fill with things that mean something to us, like the Monaco Grand Prix print on the wall in the background of this photo. I loved creating with the Home Story Kit, and after creating three projects with it as a guest storyteller, I still have plenty of product to record more memories. I'm so happy to have these photos recorded, as I know that the images and details of each home we've lived in slip away after a few years. Thanks so much for stopping by! Happy creating this weekend! Introducing Title Builder Volume 2! I LOVE creating titles! Not only coming up with clever titles, but also choosing the product to make them! When I launched my class, Terrific Titles, at Big Picture Classes, I wanted to create a product that made title building easier, and that's when I paired with Elle's Studio to bring you the original Title Builder products! Now, Title Builder Volume 2 will add even more title possibilities to your stash! Watch this introduction video to see what you can create with this fun product! I had so much fun creating with these new products last week! I quickly and easily made three simple projects, with beautiful and poignant titles! I love how easily they come together with these Title Builder products! Title Builder has been designed to work as a series of a 6" x 8" stamp, acrylic and wood veneer which you can get in a specially-priced bundle for 15% off the retail cost, or you can buy each piece individually. With your purchase of the Title Builder Vol. 2 stamp or the bundle, you will also receive a PDF via email with over 100 title combinations that you can create with the stamp only! Add on the words from the acrylic, wood veneer or alphas from your own stash, and the possibilities are endless! I can not wait to see what you create with these fun, new products! Be sure to tag me, @meghannandrew on Instagram, or simply use the hashtag #EllesStudio if you order, when your box arrives, or when you create with Title Builder Volume 2! 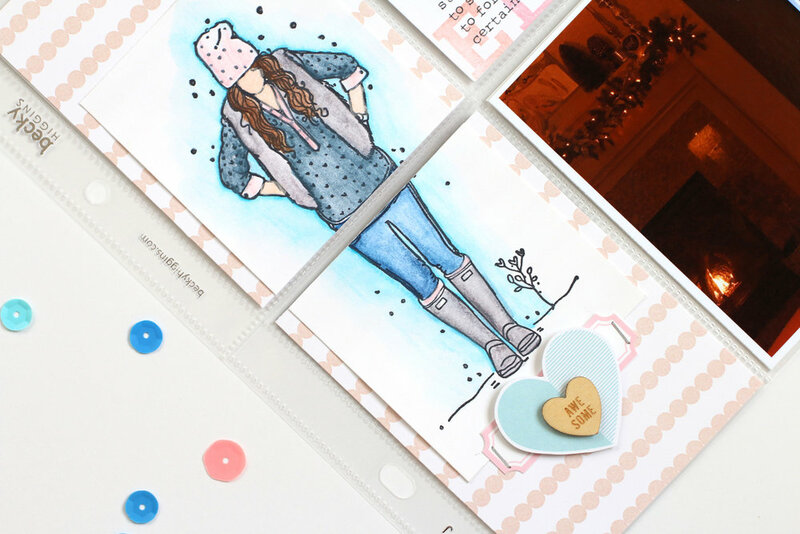 The April kit and extras* from Elle's Studio are so fabulous, I've created another project to share with you today, and this is my favorite type of project—a layout and pocket page combination! I created this project about a wonderful day that we spent on the U.S.S. Midway in San Diego, California. I love pairing layouts and pocket pages when I have a lot of photos to document without a lot of time. This day was certainly worth the multiple pages. The new Mini Dated stamp was perfect for adding the date to this die-cut from the April 2018 kit. With such a fantastic choice of tags, die-cuts and embellishments this month, this spread was easy, and so fun to put together! Be sure to check out all of the new product in the Elle's Studio shop, including the Noteworthy collection! Hi there! Since I'm so far behind on my 2017 monthly pocket page documentation, I want to set myself up early for 2018. I plan to stick with monthly spreads, using only phone photo per day, journaled and printed from my Collect App. I started off these tags by re-coloring my Monthly Puffy Stickers, using one of my favorite products, a Sharpie oil-based marker in metallic gold. These markers are amazing, and I've used them for a number of craft projects—even painting ceramics! I highly recommend them! I left the stickers on the backing and covered them with the oil-based paint, which went on beautifully. Next, I chose the 3" x 4" buffalo check journaling tag from the Love This Printables, opened it in Photoshop Elements, and re-sized it to 4" x 6", placing the check pattern on the base. I also de-saturated the color 100%, making the check pattern gray, a great neutral, which will work with any spread from next year's album. Once the tags were printed on thick, smooth white cardstock, I stamped "hello" and "documenting" in gray using the Title Builder Stamp. Next, I adhered my gold monthly puffy "January" sticker next to my stamped words. I love the way that it looks against the gray buffalo check pattern! Since January is the kick-off to a new year, I also re-colored and added "2018" from the Monthly Puffy Stickers to this tag. I created all twelve of the tags for my 2018 album, and I am so excited to have a head-start on an important part of this big project! At the beginning of the page, we were headed back from a road trip to the mountains. The "life in photos" die-cut circle from the October kit was perfect for dressing up this yellow tag from the Favorite Season printable, and I also added a stamped "love" circle from the So Cozy stamp and a green "x" from the Summer Puffy Stickers. I'm still using them on my layouts! Below that, I added the "notes from this" phrase from the So Cozy stamp, then a piece of chipboard from my stash below. October usually means racing for us, as we go to the Austin Grand Prix each year here in Texas. I loved the way that the diagonal striped 4" x 6" tag from the October kit pointed directly to my "F1 Grand Prix" journaling tag. 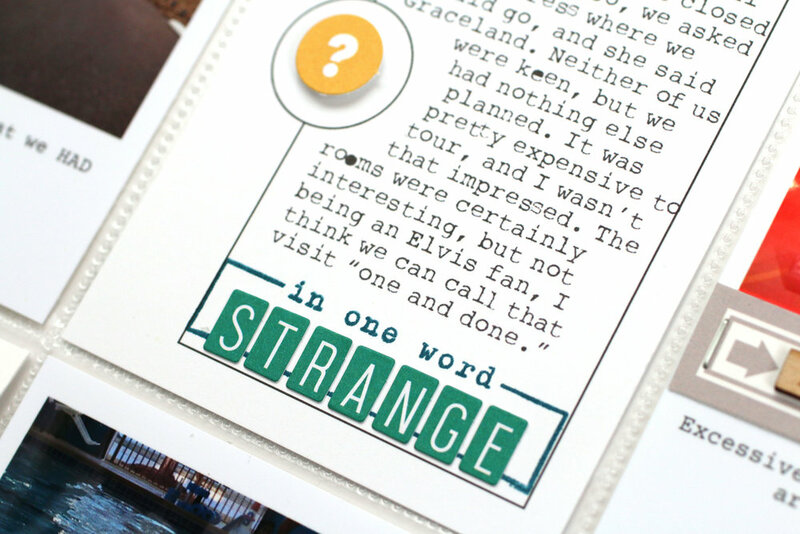 I also added the "play" stamped circle from the So Cozy stamp in the top corner, to add a little bit of orange. I was happy to get myself in this page, too, sporting my favorite driver, Lewis Hamilton's gear. The next tag's background was created with a piece of the Family Fun 6" x 6" Paper Stack, and was perfect for the "being together tag" from the October Kit, an acrylic heart from the Stars and Hearts Mixed Acrylic and a the heart Vellum Speech Bubble. How awesome is this little frame included in the So Cozy stamp? I stamped the frame, then "so cozy" inside of the frame before cutting it out and adhering it directly to my photo with dimensional adhesive. It was the perfect saying for this photo! Thanks so much for stopping by today! The new products in the Elle's Studio shop this month are just perfect, and with them I created one of my favorite pocket pages to date! Later, I'll be sharing how I'm doubling this page up with another layout to finish off the month. Until then, be sure to shop these supplies from the gallery below before they're sold out of the shop! Happy creating! September Pocket Pages Using the New Elle's Studio Kit! I love all of the energy in this page, and I really kept the embellishment to a minimum, but it doesn't appear so! On the left side, I used the blue 4" x 6" tag from the new Family Fun Journaling Tags to top my spread, stamping "SEP" over and over in blue ink using the Dated Stamp. The embellishment I used on this side was only the Date Night Stamp, Thankful Sticker Labels. Wood Veneer Borders and die-cuts from the kit. I also had to use one of the new Foodie Journaling Tags to document a favorite lunch spot! On the right side of the page, I used the Sweater Weather Printables to create a customized 4" x 6" tag for the top of the spread. By taking a 3" x 4" tag from the digital file, duplicating it and mirroring it on a 4" x 6" page, then re-colored it to match my spread. The entire process only took about three minutes, and I created a tag that works perfectly for this spread! Because a birthday photo was next to the tag, I added the balloons from the Happy Birthday Stickers and Happy Birthday Stamp, along with some Autumn Sequins. I carried the "SEP" title from the left side and added "story" using the Title Builder Stamp. On this side, just like on the left, I used very little embellishment— mainly stamps and die-cuts from the September kit. On this journaling tag placed next to a photo of my new goddaughter, I added "I love being your" and "mother" from the Family Fun Stamp, and added "god" using the Olivia Alphabet Stamp, along with a Family Fun Acrylic Shape heart. 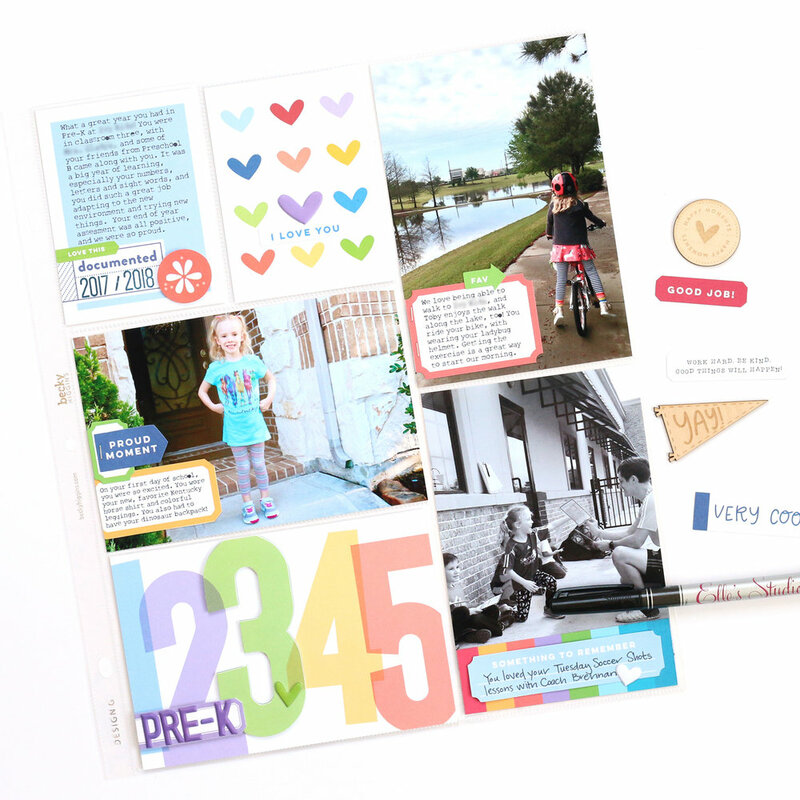 This page came together quickly and easily because the September Kit coordinates so well with the new Family Fun collection. Check out all of the new product in the Elle's Studio shop today to help you document your September memories! My title pocket was created with the fun, colorful tag from the Happy Birthday Journaling Tags. I started the quote out with the word "memories" from the Live Laugh Love Puffy Stickers and searched online for a quote about memories, finding this one from Rosa Parks. I loved it, and typed it in Photoshop before printing it on the tag. A few more puffy stickers and an Acrylic Birthday Confetti piece finished off the pocket, which introduced the page. This page documented a surprise trip to my mom and dad's for my father's 60th birthday. I had to create a tag that documented that, and the balloon Happy Birthday Stickers and Dad acrylic and word set helped me add a bit of embellishment to the Happy Birthday Journaling Tags. This may be one of my favorite ever embellished tags in my album, although my sewing machine was acting up that day when I sewed the balloon strings! Summer to me means baseball games. I love going to them with my family, and our hometown stadium is so fun to visit. I used the "like it/love it" tag from the April 2017 Kit as a base for my pocket, typing my journaling and adding a cut tag from the Live Laugh Love Bits and Pieces and a piece of printed Live Laugh Love washi tape stickers. Check out the FREE Scrapbook and Cards Today summer issue to red my full article and get loads of summer scrapbooking inspiration! Happy creating! When I found out that The Gilmore Girls: A Year in the Life was coming out in the fall, I was SO excited, as were most 30-somethings all over the country. But when it was released, the day after Thanksgiving, we were just about to embark on a trip to Hawaii and Disneyland, so I waited. I waited through December, until my husband left for work, and waited again until New Year's Eve, when my daughter was having her tonsillectomy. All of that waiting was completely worth it, and because the event was part of my New Year's celebration, I decided to document it in a pocket page. I even included a photo of The Dragonfly Inn on my TV screen with my twinkle lights on the mantel and a fire in the fireplace. Ah... cozy! I took my color scheme from the official A Year in the Life image with the beautiful sky blue background, as well as the photo of Lorelai and Rory grabbing a coffee and the morning paper in Star's Hollow. Mixing the beautiful light blue, with navy and pink felt just perfect for this spread. Back in March, when I attended Scrapbook & Cards Today's Crop and Create Toronto, one of my kind, fellow croppers gave me this Lux Girl stamped image by Angie Bloom and Unity Stamp Company. It reminded me so much of Lorelai, and I knew it would be perfect to use when I was ready to create this spread. I held onto it for three months & coloring it in with watercolor pencils and a water pen was so relaxing. I backed it onto a piece of striped patterned paper from an old Scraptastic Club kit, and cut it in half, so that it would fit across two 3" x 4" pockets. Since she was looking down, I wanted to put a bit of embellishment under her feet, so I added label and heart die cuts, as well as a wood veneer heart. Alongside the Colorcast Designs veneer and acrylic pieces, I also used the Elle's Studio TV Wood Veneer, Journaling Tags and Stamp. We don't watch much television around here, but I think documenting what little we do watch is important! Since we just started House of Cards on Netflix, you can expect to see another spread using these supplies to document that series later in the year! What shows do you watch? Have you documented them yet? For the first time in four years, I have successfully finished my Week in the Life project, and I'd love to share it with you! Our life has significantly changed over the last year with my husband on a 28-day rotation, so it was very important to me to finish this project this year. I wanted to see things through my lens, most importantly, see the POSITIVE parts of our life, because to be honest, when my husband is gone, I sometimes feel sorry for myself. This week happened to fall during a week when he was away, so it documents the daily lives of my daughter, dog and I, and as I expected, it was eye-opening. When not in the daily grind, I can see just how blessed we are; to have each other, to have technology to speak and see each other, and to have the means to do fun things and eat great food. This week was also special because it fell on my 34th birthday, and on our March for Babies walk with the March of Dimes, a cause we greatly support raising a former micro-preemie. I mainly used products that I only had on hand: my working monthly pocket page album, pocket page protectors that I already had, and some supplies already in my stash. I find that when I order supplies and wait for them to arrive, I've lost interest in the project by the time it arrives. I didn't pressure myself to use my DSLR outside of the house. I feel completely uncomfortable with snapping photos with my BIG camera at Costco or Target on daily errands. So I told myself that photos taken with my iPhone were going to be just fine. Every night before bed, I used my Notes app to document an hour-by-hour breakdown of what happened during the day. When creating the project, I simply emailed those notes to myself and copied and pasted them into my Photoshop page, elaborating slightly from what I had written on the day. I kept to only one pocket page, front and back, per day. To begin, I created a small cover page to delineate the beginning of WITL in my monthly pocket page spread album. I downloaded the PNG "my story matters" file from the Week in the Life Community page, adding it to the left column of an 8-1/2" x 11" sheet in Photoshop Elements. I then "cut" the multicolor stripe pattern from one of the tags in the Week in the Life Digital Bundle into 1/2" strips and placed them along the left margin. I printed the page, cut it in half and adhered the right side to the back to make it thicker before I punched the holes. For this alone, I'm glad that I purchased the digital bundle, especially since I didn't want a stand-alone album for this project. Before each day's pocket page, I added another 4-1/4" x 11" cardstock page with the words of the week— an hour-by-hour breakdown of our day. I created these by using the "today's details" image from a 3" x 4" tag in the Week in the Life Digital Bundle to top the left column on my sheet, then I copied and pasted my words from what I documented in my Notes App. After I printed the page, I cut it in half and again adhered the right column to the back of the sheet. I wanted a space to add the date, but since I didn't have room at the top, I stamped the date repeatedly on the left margin in the same color as I had made the "today's details" image. I continually mixed up my pocket page designs throughout the week's documentation, but each day had the same setup: I used one 4" x 6" pocket to add the vellum days of the week word from the Week in the Life Digital Bundle. All of my photos were printed with a white border, which makes the different sizes congruent. I also added one or two filler tags, to give myself a break and add a bit of pretty paper. I wanted a few different textures for my embellishment, and I chose these Elle's Studio Work Hard Wood Veneer pieces. Although they have a "work" theme, the sayings were easy to incorporate throughout the pages. I definitely don't often do this, but I stamped directly onto my photos. And yes, I screwed it up a few times, having to re-print the photo. But I love how I used the images in the photos to tie in the stamped words, like in this bath photo of my daughter using the Lens Story Stamp from Ali Edwards. This might be one of my favorite parts of these pages. I had to take some marketing images for my Terrific Titles class at Big Picture Classes, and the light in my office was just perfect. The "I heart my job" wood veneer was perfect to add to the bottom of the page and the "this is my happy place" tag from the free Elle's Studio NSD digital file , re-colored to match the Week in the Life Digital Bundle was perfect to add next to it. Even though I hate doing it, I added my own handwriting on a couple of journaling tags. Mainly because this was my LAST STEP of completion, and I was too lazy to scan in the tag and type my journaling up in Photoshop. Just being real. It was pretty awesome to add photos of my daughter's Spanish performance at school in the album, as well as a complete temper-tantrum breakdown in the bottom right corner. Real life. Cooking and eating are a BIG part of our daily lives, so of course photos of our meals appear throughout the album. I plan to keep these blue-rimmed plates forever, since I love the way they look against our white farmhouse breakfast table. The "post midnight" photos from my 34th birthday celebration did not make an appearance in the album, for obvious reasons. We are deeply involved in our local March for Babies, benefitting the March of Dimes, so it was pretty awesome to have this documented on the final day of WITL. So, an epic project is complete. Thanks for getting through this epic blog post, too! Happy creating! I'm about six months behind with my Project Life spreads from 2016, but I'm trying not to let that stop me from finishing up this project. I wanted to start with the 'elephant in the room,' my December spreads. It's definitely the month that I've taken the most photos, so there was a lot to document. Plus, I decided early on not to take on a December Daily album project this year, so these pages are all that I'm documenting for the month. I started off with my first page setting the tone for the entire month. I typically try to choose a multicolored card that can set my color scheme, and I did that with the multicolored starburst card in the second row. From there, I chose other tags to coordinate with that one to fill the remainder of my pages. The bright color scheme worked perfectly for the things that we did this month, including a trip to Hawaii and Disneyland. I kept my embellishment quite simple, but used a lot of stamps to create and add to my filler tags. I love the Magic Journaling Cards no. 1 from In a Creative Bubble, and I was excited to use that 4" x 6" castle tag, embellished with just a few rhinestones. Page four was all about the week leading up to Christmas, which I spent with my family, so I had lots of journaling to add. On the right side, I put my Christmas present tags in the pockets. My parents loved them, and took some of them home, so these were the leftovers. My final page was all about the week after Christmas and my daughter's surgery. You might just see a little sneak peek on this page of fun things to come from Elle's Studio. Stay tuned! I can't wait to wrap up 2016 in it's album. I guess I had better get to work documenting and filling those pockets!